Aiming the Putterface: Is Your Putter Pointing in the Right Direction? Aiming is not easy as your eyes work best from behind the target with your eye-line level with the horizon, and not when you are positioned side-on to your target. In a number of sports, such as basketball and tennis, you face the target and have the benefit of binocular vision. When you putt you are alongside the ball, and from this angle your vision can be skewed. Where you think you are aiming the putterface is not where the target really is. This is why some golfers on tour use their caddie to line them up. Faulty visual perception is more often the cause of missed putts than faulty stroke mechanics. Dr Jim Suttie, co-author of The LAWs of the Golf Swing maintains that nine out of ten putting errors are the result of aiming your putterface poorly. Having a sound stroke, but sending the ball off on the wrong path is hardly effective. The degree of misalignment of your putterface magnifies any error as your putts get longer. An error of one degree off-true in aiming your putterface translates into 2.1 inches off-target at 10 feet. Because of the difficulty of aiming your putterface to a distant target, it is easier to aim at an object close by within your peripheral vision. The tests I have conducted on a golfer's ability to aim the putterface accurately show that accuracy starts to fall off after a few feet. So how do you improve the accuracy of aiming your putterface? One solution has been to putt facing the hole, but it has few converts. Most of us still putt from the conventional side-on position. However, there are a number of things that you can do to get the percentages working in your favour. The manner in which you lower your head over the ball at address will determine how accurately you sight the ball and your aimline (target line). In earlier days the advice was to position your head flat to the ground, and this is still good advice today. Ideally you should set up with the line of your forehead and chin level and look vertically down on the ball. The more that your head is tilted up causing you to look down your cheeks to see the ball, the more skewed your perspective of the target location will be. If your head is too high, you will have to turn and lift it rather than swivel it towards where you want to direct your ball. This usually makes aiming your putterface more difficult. A simple technique to achieve a flat head is to place your hand horizontally with your fingers extended across the bridge of your nose. Then in the address position lower your head until the ball comes fully into view. 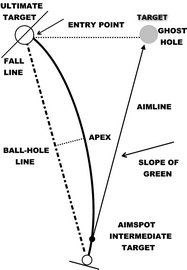 Your eyes should be on the same vertical plane as the ball and your aimline or marginally inside. This orientation will deliver your line of sight in a straight line to your target. If your eyes are too far inside the ball, your perception of your target will shift to the right. If your eyes are out beyond the ball, you will tend to perceive your target as being more left than it really is. In both cases your eyes will now be in a diagonal rather than a vertical plane. This makes it difficult to get an accurate perspective of your aimline. For more information of mastering putting through peak visual performance you should read See It & Sink It by Dr Craig L Farnsworth. If you use a line or the logo on the ball to line up your putter face and your eyes are not in the same plane as the ball, the line will appear to point either left or right of your perceived target. It is hard to accept that your eyes only play a limited part in putting. After aiming your putterface and with a clear idea of how far your ball must travel to reach the hole, your vision becomes secondary to your sense of feel. Vision at this point can even harm your putting if you allow your eyes to wander during your stroke. Keep your head and your eyes still remains good advice. In order to perceive three dimensions, the information you get from both your eyes is important. However, each of us has one eye that takes priority over the other. This is your dominant or aiming eye. It is sometimes referred to as your master eye. To find your dominant eye, cup your hands and pick out an object in the distance. Follow the instructions shown on the chart. If you are right handed, your dominant eye will probably be your right eye, but there is not a one-to-one relationship. It is important for you to position your dominant eye behind the ball when you are lining up the logo or picking a spot along your aimline. If your dominant eye is not behind the ball, even by a fraction of an inch, you may perceive your target further to the side than it really is. A well-known tip in putting is to use a line (or logo) on your ball to improve the accuracy of your aim. The logic of this suggestion is based on the fact that it is easier to aim from behind than from side-on. Positioning your dominant eye behind the ball the technique is to point the line at your target and then match the alignment aid on your putter for aiming your putterface. Once you have done this, you align your body parallel to your aimline. The simplicity of this method is not all what it seems. A number of tour players don’t use a line on their ball because they feel that it creates visual noise. They prefer to see only the white dimples. So should you use a line on your ball or not? There is a lot of merit in using a line if you know how to do it properly. Part of the problem comes from your head and eye position. If your gaze is not perpendicular to the ground with your head over the ball, the line will look wrong when you get ready to putt. There will be a conflict between where the line is pointing and where you think you should be aiming your putterface. This doubt is not good for confidence. A second problem has to do with how well you are able to aim the line. Your head is higher than the ball when you squat behind it. This is not an ideal position for accurate aiming. The solution is to leave your ball marker in place and then step back from the ball a few paces and confirm the direction the line is pointing. The final problem is the distance of the target that you are using for your aim. Aiming at a foreshortened target is more accurate than a more distant target. Beyond a few feet where you think you are aiming and where you are actually aiming start to diverge. I have tested this with golfers using a laser in the ball. If you do decide to use the line, you must accept totally that it is aimed correctly. There will always be the temptation to re-target when you are over the ball. If you start to make fine-tune adjustments with aiming your putterface, you may as well not use a line. A separate advantage of using a line on your ball is the feedback it gives you on your stroke. If your stroke is good, you will see the line rolling end over end rather than wobbling one way or another. On breaking putts some golfers pick an intermediate spot along the break slightly in front of their ball. It is the same idea in ten pin bowling where a bowler doesn't aim at the pins, but at one of the spots in the lane. This method may not suit everyone. A spot putter picks out an intermediate target, real or imagined, on their aimline and then focuses on rolling the ball over the spot at the right speed. Mike Shannon, a top putting instructor, talks about Linear and Non-linear putters. Linear putters like structure so spot putting suits them. Non-linear putters putt more by feel and see a curving path in preference to spots. Tiger Woods describes himself as a feel putter who relies on good mechanics to roll the ball where he aims it. Whatever system you use, you still can't avoid the obvious; namely the need for aiming your putterface perpendicular to your aimline.